Jaggery will be performing “Bottles”, a song I wrote for them as part of our song cycle project! 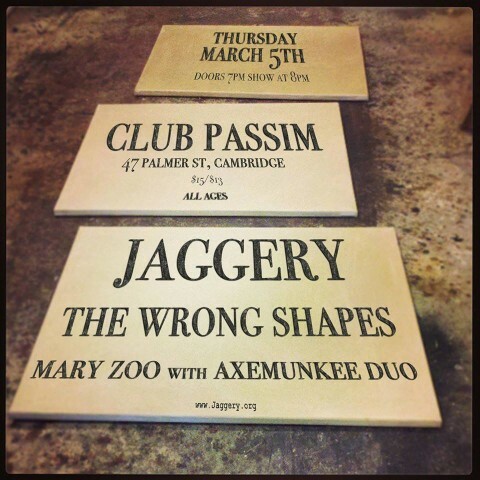 The gig is at Club Passim in Harvard Square, and will also feature Mary Zoo and The Wrong Shapes. Dig it. I worked with OtherSide Entertainment on music for their Kickstarter trailer! They’re hoping to reboot Underworld, a series of seminal CRPGs from the early ’90s that I loved when I was a kid. Check it out and decide if you want to help! Parquet Deformation, the third movement of Honey Glazed, has been chosen for inclusion on Ravello Records‘ recent release Vanguards, Volume 1! You can buy the album on iTunes here. Here’s a taste of another Fantasia: Music Evolved realm, The Capsule! Most of my contribution to this level was sound design, and music and interaction design for the Solar Slider, which you can see a snippet of at the very end.